This item contains placenta extract, and provides one approach for tackling wrinkles and sagging skin. Purelady’s Placentia essence is designed to help counteract the effects of time on your skin. It contains SLA capsules, which are aging care capsules developed uniquely by Sugarlady. These capsules contain four ingredients in particular that will help you to have beautiful, youthful skin: morus alba root extract, adansonia digitata seed oil, geranium robertianum extract, and citrus junos fruit extract. 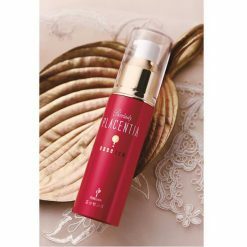 Purelady’s Placentia essence will aid in thoroughly moisturizing your skin, and help it to be soft and springy. If this beauty essence is used before your usual skin care routine, it will make the outer layer of your skin more pliable and allow any products you use next to more fully sink in. After washing your face, dispense an optimal quantity (1 to 2 pushes) of Placentia essence and gently smooth it into your skin. Then, proceed with the rest of your usual skin care routine before the essence fully dries.This item pairs with our other two Placentia items. The Placentia essence is applied first, then the Placentia lotion, and lastly the Placentia cream. These three items can be purchased individually, or as a set (item 7772).Caution:-While using this product, keep an eye out for any skin abnormalities. If the product does not agree with your skin (namely, if any of the below occur), cease use of the product. If you do not cease use, you may aggravate your symptoms; so please consult with a medical dermatology specialist.1. If your skin experiences slight redness, swelling or boils, itchiness, irritation, loss of color (white spots, vitiligo, etc), or darkening, cease use of this product.2. If any of the above occur when skin on which you have used this product is exposed to direct sunlight, cease use of this product.-Do not use this product on or near areas of skin where you have a wound, a tumor or swelling, eczema or a rash, soreness or inflammation, or abnormal pigmentation.-If you get any of this product in your eyes, rinse them immediately.-Caution (regarding storage and handling):1. After each use, be sure to securely replace the cap.2. Store out of reach of infants.3. Do not store anywhere that becomes extremely hot or cold, or anywhere that receives direct sunlight.4. Keep the openings of the bottle clean and sanitary.5. Once this product has been opened, it should be used within 6 months.6. When the bottle appears to be finished, check for any remaining essence on its inner walls.